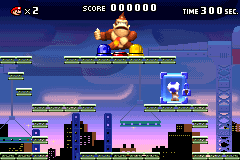 Donkey Kong (called BOSS in the pause menu) is the final level of the main worlds in Mario vs. Donkey Kong. During a cutscene after the previous level, Donkey Kong kidnaps the Toads and takes them up a building. Mario gives chase and the level begins. Donkey Kong will begin by rolling down spiked Barrels, occasionally rolling down a large Barrel, and press the three Color Switches. These Color Switches will determine what color Key appears on the third level of platforms. 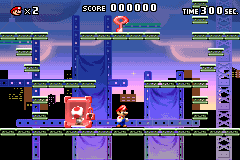 The player needs to grab a Key and jump across platforms while dodging the barrels to unlock a Toad's cell of the corresponding color. Once a Toad is freed, it will move off the stage. When all three Toads are freed, the player then needs to continue dodging the Barrels. Once a large Barrel rolls off screen, the Toads will bring it back for the player to pick it up. 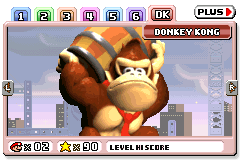 The player needs to carry this large Barrel up to the top of the stage and then throw it at Donkey Kong, who will be knocked down to a lower platform. The player needs to repeat this process two more times, though Donkey Kong will roll Barrels out faster each time he is knocked down. After throwing a large Barrel at Donkey Kong a third time, he will grab onto the edge of the lowest platform and the Toads will jump on his fingers, causing Donkey Kong to fall off the building. The credits of the game will then roll and another cinematic will play out afterward. Donkey Kong will fall into a truck containing Mini Mario toys. The truck gets destroyed and the Mini Marios fly everywhere, with Donkey Kong sitting where the truck used to be. Mario comes down the building and wonders if Donkey Kong is okay, but Donkey Kong gets up and starts stuffing his sack with Mini Marios once again and runs off. Mario gives chase once more, and the Plus Levels begin. This page was last edited on April 14, 2019, at 15:56.